Bobby O'Fallon became the 29th Boy Scout in Paynesville history to join the ranks of Eagle Scouts on Saturday. For the second time in 18 months, the son of the local scoutmaster has become an Eagle Scout. Bobby O'Fallon became the 29th Eagle Scout in Paynesville history on Saturday afternoon, following classmate Jon Scheierl, who became an Eagle Scout in September 2001 and whose dad Tom was the local scoutmaster for years. O'Fallon is the son of Gretchen and Jim O'Fallon, who replaced Tom Scheierl as scoutmaster. Bobby O'Fallon comes from a scouting family. Besides his scoutmaster father, and his mother who also volunteers to help the local troop, his younger brother Russell is in his first year of Boy Scouts. And O'Fallon has an uncle, Bob, who is an Eagle Scout and who spoke at Bobby's Court of Honor on Saturday at the school auditorium. Two other uncles and two cousins led the Pledge of Allegiance on Saturday. Bobby joined scouting as a Tiger Scout in 1992 when he was in kindergarten or first grade. He joined Boy Scouts in 1997 at the end of his fifth grade year. "When I first joined Boy Scouts, the first meeting I ever went to was a Court of Honor. That's when I decided (to become an Eagle Scout)," said O'Fallon. That Court of Honor was for Casey Meagher, a family friend, which helped reinforce his decision. 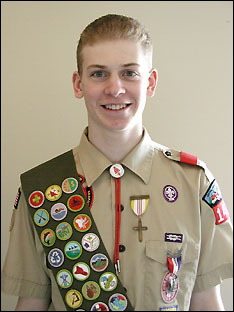 As a Boy Scout, O'Fallon has earned 28 merit badges. He used 21 in his application for Eagle Scout, which was approved in January. The three hardest to earn were his citizenship badges for the community, for the nation, and for the world, which require scouts to learn about the various levels of governments and the rights and responsibilities of citizens. The merit badge that was the most exciting to earn was for climbing, which he earned at summer camp in 2000. For that, they climbed a 50-foot wall, said O'Fallon, and then free rappelled with ropes. His most grueling merit badge was for cycling, which required him to bike 150 miles, making trips around the lake, to St. Martin and back, and a 50-mile route on the Tour of Saints from Cold Spring to St. Ben's and St. John's. For his Eagle Scout project, O'Fallon chose to make a wheelchair-accessible flower planter for the Koronis Manor. Gardening and tending flowers, O'Fallon was told, is something the residents like to do year-round, and his table offers a place to do this indoors. An Eagle Scout project involves more than just doing something yourself. O'Fallon was responsible for designing the flower planter, getting the materials, getting donations to pay for the materials, and organizing the Boy Scouts and other volunteers to get the work done. He spent 12.5 hours organizing the project, including getting donations from the American Legion in Paynesville, from the Paynesville Lions, and from Meeker County Cooperative. He also spent 28.5 hours working on his project and got other people to donate 66.5 hours of work to his project. They built the 75" by 80" by 36" flower planter at Mueller Wood Products, with help in design from Butch Mueller and in construction from Jim Spanier. Then he and other scouts stained the flower planter at his house. They had to wait until the construction was done at the Koronis Manor before delivering the flower planter in May 2002. 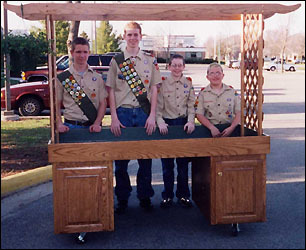 Joe Lingl, Bobby O'Fallon, Russell O'Fallon, and Jake Deadrick pose with the handicap-accessible flower planter before delivering it to the Koronis Manor in May 2002. O'Fallon was pleased that his flower planter cost $500 to make, while to buy professional ones would cost at least $1,200. Bobby had to complete the paperwork for his Eagle Scout and passed his board of review in January 2003. Eagle Scouts from Paynesville - according to Press records - are: Craig Brinkman, Paul Brunik, Steve Dosdall, David Easterday, Troy Gerding, James Gilk, Scott Ingalsbe, Steve Gilk, Mike Klein, Joe Lingl, Leo Louis, Ryan Louis, Casey Meagher, Jon Millner, Jared Morris, Scott Morris, O'Fallon, Mike Putzke, Randy Schaefer, Russ Schaefer, David Scheierl, Jon Scheierl, Jeff Skrypek, Gary Wagner, Dan Welter, Lyle Wendroth, Loren Wendroth, Larry Wendroth, and Eric Werlinger. This summer, he plans to go on two trips with the Boy Scouts: to South Dakota and to Camp Cayunna by Cross Lake in northern Minnesota. Scouting has always been fun, said O'Fallon, doing stuff with friends and going places. A highlight for him was going to the National Boy Scout Jamboree in 2001 in Virginia and visiting Washington, D.C., on the same trip. In addition to scouting, O'Fallon, a junior at PAHS, plays football and baseball and in the bands at school. He is also a peer mentor and D.A.R.E. role model. He is a mass server at St. Louis Catholic Church and enjoys hunting, fishing, and four-wheeling.